When we think of collected editions, we normally picture a trade paperback or hardcover that compiles an average of five or six issues of a given storyline into one tome. But since Deadpool plays by nobody’s rules but his own, expect the ninth volume of his current series to be an exception, not the rule as it were. Here’s the deal: As you may have heard, the upcoming Deadpool #30 is slated to be an oversized affair, effectively amounting to 80 pages. Given that, it will retail at $9.99, a bit heftier than the average Marvel book, which tends to be priced at $3.99. What’s interesting about this situation is that the publisher is opting to release it as its own trade paperback in the fall, rather than having it join subsequent issues for a collection. Now, this isn’t unheard of, as it does bring to mind DC Universe: Rebirth #1 being reprinted as a deluxe hardcover as well when Archie Andrews’ alternate universe demise in Life with Archie was swiftly turned around as a paperback dubbed The Death of Archie: A Life Celebrated. Deadpool. In. Spaaaaace!!! 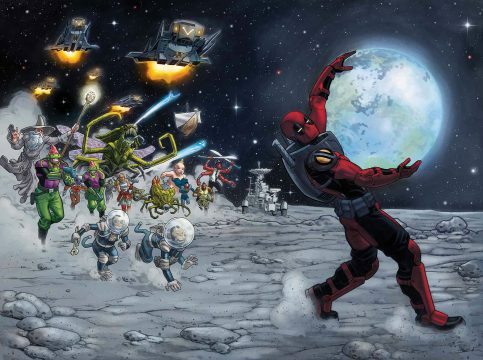 Wade Wilson is heading off Earth on a personal mission – one that will land him in all manner of cosmic trouble! Plus, a secret story known only to compulsive Deadpool variant cover collectors, as Odin ejects Deadpool from reality -and into the cover-verse! Can a team-up with UPC-PO, the living embodiment of the UPC code, help Wade return to the world he left behind…or will it just be an excuse for parodies and shenanigans? We’re guessing the latter. On the plus side, Deadpool diehards will at least get some supplemental material if they opt to spend the extra five dollars for the trade. I’m sure some will double dip, but there will be those who prefer the monetary value to be appreciated by a floppy copy, and then there will be those who like to have something bound to place on their bookshelf. Feel free to tell which is your preference in the comments section below!